In 2013, the total number of events organised by others was 1,249. Revenues generated from these events increased by 10.5 percent from 2012, to a total of € 1.2 million. Although the number of events increased, the average amount raised per event (excluding ‘538 for War Child’ action week events) decreased. 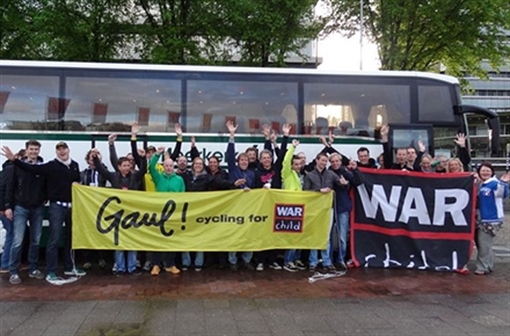 In 2013 at least two hundred people ran the ‘Dam tot Damloop’ for War Child, raising € 25,000. However, we had expected this event to raise more income, in part because we invested more in our runners, such as providing a training day at Papendal. In 2014, we will again organise a training day and invest more time in helping the runners raise funds from the moment they can sign up on the website. Our Gaul! cyclists raised € 34.440 in 2013 through their Mont Ventoux Challenge, Queensday events such as selling pancakes, and numerous smaller cycling events. The group met with War Child at the end of 2013 to explore possibilities to expand this partnership. While the amount of money raised per event decreased, more and more people are willing to organise an event for War Child, indicating great potential for future income. Event organisers are increasingly asking for more support from War Child, which requires more time from War Child employees. To capitalise on this potential, we either need to support the mobilisation of more events or seek ways of helping event organisers raise more money through their events. We see potential in becoming more proactive in our approach to inspire and mobilise companies, service clubs and (sport) events to organise fundraising initiatives for War Child.